Why is the Sales Funnel a Funnel? How on earth has the image of a funnel become the prevailing symbol of sales process and sales forecasting the world over? Funnels come in all different shapes and sizes. The one I’m looking at in this post is your typical kitchen funnel, with a bulbous part that holds the liquid and then a long narrow shoot below it. Your classic sales funnel graphic, however, is a tall, narrow V shape with lines across it, within which lines are the sums of sales opportunities for each specific sales sales stage at that specific moment in time. The early stage opportunities are at the top, and the later stages are towards the bottom. The later stage opportunities are less plentiful – would that it were the other way around! – hence the unmistakable V-shape. The differences don’t end there, however. Firstly, the sales funnel image is usually 2-dimensional, whereas you could really do with something in 3-D. Furthermore, when you think of a real funnel, all the liquid falls through the bottom, whereas in the sales funnel only the won deals fall through to be processed. Where do the non-deals, the lost deals and the qualified-out deals go? Do they evaporate from the funnel? And wouldn’t it be great if we could get a sense, over time, of how and when deals are dropping out or dropping down from one stage to the next, more advanced stage? And, while we’re at it, some sense of where the deals originated would be handy too. 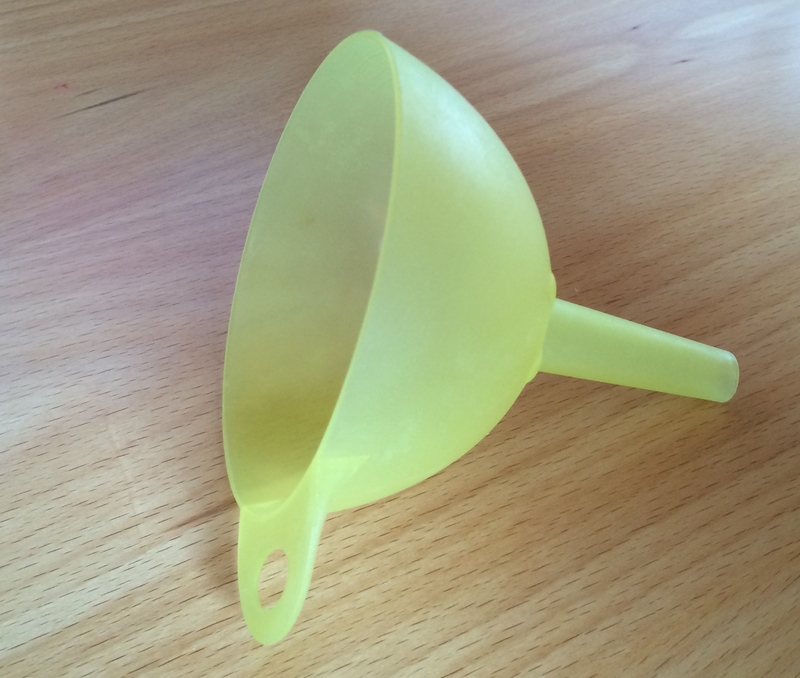 No, the funnel is a lousy symbol, and so is the ‘hopper’. The ‘pipeline’ is no better.We need an image that acknowledges both the linear nature of a sales process but also the cyclical nature of continually qualifying a sales opportunity. Something that loses progressively smaller volumes as it goes along until only the good stuff comes out. Leave that one with me…unless you’ve any suggestions? Remember that your sales process should mirror the buying process of your customers. The more complex the product or service you’re selling, and the more expensive it is, the more sophisticated your sales process should be, because your buyers will want to have an awful lot of ducks in a row before they commit to you. Forecasts miss because companies don’t take time to map out their sales process and coach their sales people to follow it. Forecasts miss because managers have to rely on sales people’s subjective assessments of how a sale is going. An objective, scientific sales process takes personality and guess work out of forecasting and gives you the manager a checklist for assessing with your sales people what could go wrong in the sale and how you could prevent the mis-step. Don’t forget that the sales forecast is based around an artificial time frame, namely the timeframe of the selling organisation. ‘I think I can close that deal by the end of our quarter.’ But what if your customer is not ready to buy at the end of your quarter? When a deal slips out of the sales month or the sales quarter, it’s usually because the customer’s not ready to buy from you. The better you know the steps your customers want to take to buy from you, the better you follow those steps, the more accurate your forecast. Is Your Pipeline Nothing But A Pipedream? In the high octane world of large deal size, long and complex sales cycles involving many buyers and influencers, there’s an awful lot to think about and an awful lot of work to do. It seems unfortunate, then, that forecasting such deals remains a black art, despite the technology in place focused on helping this tricky area. This is because the technology is simply the delivery mechanism, and if your data and discipline is weak, what it delivers is weak. Many hours get taken up in forecast calls and meetings, with jargon like ‘drop dead’, ‘best guess’ and ‘upside’ permeating them and generally obfuscating the truth, or as close to the truth as we can manage. There’s a much bandied about statistic that forecasts are about 50% accurate. That means you might as well forget your forecast calls and flip a coin. That doesn’t stop sales organisations around the world doing forecasts. Since your pipeline is really just an extension of your forecast, looking further into your future, it follows that for many organisations the pipeline really is a pipedream, a funnel full of fantasy. Outside the world of complex sales – and who knows what proportion of all sales that is, maybe 80% – there are hundreds of thousands of sales organisations that don’t do forecasts or count pipeline. They don’t set quotas or targets, they might not pay commission, they don’t do deal reviews. They have folk out there selling and what comes in, comes in. I don’t know how they can run their business with any confidence at all, especially in tough times. I think in general it’s a function of sales being so late to the top table in business. It’s something people have always done based on their intuition. Up until recently you couldn’t study sales at University or College. There was a marked absence of methodology, theory, training and formal structure. Compare this with the much newer profession of marketing which has the best part of a century’s curricular preparation under its belt. An accurate pipeline helps you plan for success and get early warnings of potential problems ahead. But you gotta get the basics right first.